This past month the awarding ceremony of the first ever Japan Documentary Festival took place in the Nippon Foundation building lobby in Tokyo, Japan. 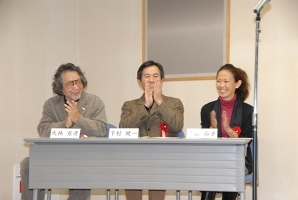 This documentary contest is organized by Nippon Foundation to promote 10min documentaries about “dreams” and “hope”. Anybody could participate and all you had to do is turn in your 10min video for them to upload it to their YouTube page . There 7 nominees for the Grand Prize, Challenge Prize, and 4 Second place Prizes. I had entered my mini documentary about Nikkey and multicultural identity in Japan. I had decided to combine my Pecha-Kucha presentation that I had done in Tokyo with the different visits that the Nikkei Scholars had done in Brazilian schools in Japan, to showing how today, you cannot define one’s nationality or ethnicity just by their appearance. It is a strong desire of mine to show that in the world today people not only communicate around the globe but also are mixing. Political geography is everyday less important or even obsolete when talking about people. Is a child who was born in Chile with Japanese parents supposed to be called Chilean? or Japanese? or either? If he had double citizenship, which country would he defend if they went into war? These are simple questions to answer, but in countries with strong uni-racial societies (like Japan) , it is not. Nobuhiko Obayashi, Movie director, screenwriter and editor of films and television advertisements who is well known for his surreal visual style. Yuko Arimori, professional marathon runner Silver medal Olympian and Goodwill Ambassador for the United Nations Population Fund (UNFPA). Shimon Miura, Director-general of The Japan Art Academy and famous japanese writer. 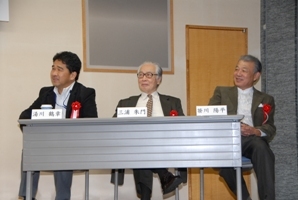 Kenichi Shimomura, TBS Announcer, director and media advisor for civil media. Yohei Sasakawa, Chairman of the Nippon Foundation and World Health Organization Goodwill Ambassador. I couldn’t attend the ceremony so my wife went instead. After the judges watched all 7 of the documentaries with the rest of the people who attended the event, they made their final pick on stage. To our surprise, I got the Challenge Award!!!! Chairman Sasakawa spoke in behalf of the judges for my documentary and congratulated my wife with the diploma and the symbolic ticket for the “world travel ticket”. I would like to thank the Nippon Foundation for organizing such a great event, Astrid Klein and Mark Dytham of Pechakucha Night , the nikkei scholars who participated in my documentary (Igor, Gustavo, Hana, Melina), and all of my friends who viewed and/or commented in the youtube page. Thank you sooo much! About the prize, I am planning on making a documentary about “okigusuri project” done by the Nippon Foundation in Mongolia and Thailand. What is Okigusuri(置き薬）? In a rough translation it means, “medicine left for use”. It started in the Toyama region of Japan where villagers would use the medicine they needed from the medicine box and paid at the end of the month, only for what they had used. This traditional system is very useful for communities where the individual does not have enough purchasing power. This system works only if there is a strong bond and trust between the communities or villages so I am very interested to discover and show how this traditional japanese system could change the way in which people in need of medicine, and not any kind of medicine, but traditional medicine can get it for a low price.